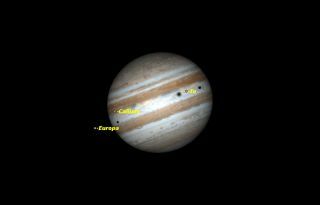 An extremely rare event occurs on the night of Jan. 23, 2015, when three of Jupiter’s moons and their shadows cross the face of the planet. On Friday night (Jan. 23), observers all across North America will witness a rare event when three of Jupiter's moons, and their shadows, pass across the face of the giant planet. How rare are these Jupiter triple transits? I have seen two in the last 15 years personally, but the next one will not occur until 2032. As the Galilean moons revolve around the giant planet, they sometimes pass in front of it and sometimes are lost in its shadow or behind the planet itself. In addition, all four moons cast their own shadows on Jupiter's cloud tops. Because of the complex gravitational interaction between Jupiter and its moons, their motions are not independent, but are locked in specific patterns. The orbital periods of the three inner moons are as follows: Io, 1.769 days; Europa, 3.551 days; Ganymede, 7.155 days. If you divide these periods by Io's period, you find that they are almost perfectly in the ratio of 1:2:4, a classic example of orbital resonance. Only Callisto doesn't fit the pattern, with an orbital period of 16.689 days. Because of this resonance, Io and Europa frequently cross the face of Jupiter at the same time, but Ganymede is always far away when this happens. The inky black shadows of the moons can be seen, under steady seeing conditions, with a 90mm aperture telescope. The shadows are very small, but very high-contrast. The moons themselves are more challenging. I have seen Ganymede and Callisto with a 127mm aperture, but Io and Europa are hard to see with my 280mm aperture, except just as they enter or leave Jupiter's disk. Io and Europa simply blend in with the cloudy surface of the planet. Here is a rundown of the events Friday night and Saturday morning (Jan. 24), given in EST. If you live in western parts of North America, subtract 1 hour for CST, 2 hours for MST, or 3 hours for PST. Notice that the different moons are in front of Jupiter for different periods because of the differences in their orbital speeds. The shadows are at different distances from the moons themselves because of their different distances from the planet. As a result, the triple shadow transit lasts 24 minutes, from 1:28 to 1:52 a.m. EST, but the triple satellite transit lasts only 4 minutes, from 2:08 to 2:12 a.m. EST. Editor's Note: If you have an amazing photo of Jupiter or any other celestial object that you'd like to sharefor a possible story or image gallery, please contact managing editor Tariq Malik at spacephotos@space.com.